Two of the nine members of the community survived; one has since passed away. Freddy Derwahl, a Belgian poet, author and journalist who had stayed with the monks at Tibhirine for a short time to “try his vocation” as a Trappist. He knew Br Jean-Pierre from that earlier time, and was able to fit readily into the rhythm and life of the monastery in Morocco where Br Jean-Pierre continues to live a life of prayer and simplicity in a largely Muslim country. 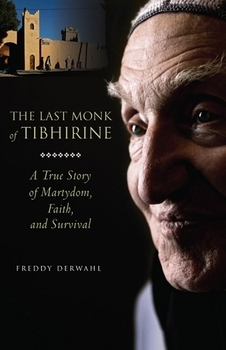 The book mingles Derwahl’s journal of his days at the monastery with Br Jean-Pierre’s story of his youth, vocation and the events at Tibhirine. This book is special because of the passage of time. Br Jean-Pierre lives daily with the memory of his murdered confrères, who photos are present in the new monastery. He has prayed and meditated on their life together, the choices they made, and its meaning. Where the film Of Gods and Men is a witness to the meaning the events had at the time, this book adds the insight of one who made the decision to continue the same life in a similar location. The writing (and the translation) is beautifully done. Paraclete Press has certainly done the English-speaking world a great service by publishing this book. I own that movie. It was a very good movie. I did not know about the book that you mentioned though, although I imagine it would be good.